My American (and maybe other?) readers are likely familiar with The Real Housewives TV series. Most people have their favorite series.... whether it be Orange County, NYC, NJ, etc.... the one and only version I watch is The Real Housewives of New Jersey! That being said, I think we all have our favorite housewife on the show too! Right? I have a clear favorite myself! Since the show is in full speed right now and the season is so great (every week I'm excited for the new Sunday night episode! ), I decided to make some nails inspired by The Real Housewives of NJ (otherwise known as RHONJ). Scroll past my photos to read about my How-To process. Is that NJ on your nails? Heck yes it is! I painted my base coats with Waltz by Essie (the white) and This Is It by Sinful Colors (the gold). Waltz had to be applied for 4 layers! 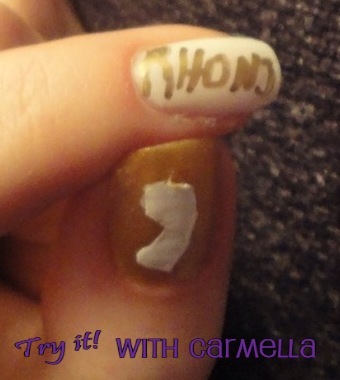 The RHONJ was written onto my nails with a gold Sharpee. The New Jersey shape was much harder! I tried out a few methods that did not work- cutting out the NJ and painting over the paper stencil, tracing the outside shape of the NJ, etc.. In the end, I wound up printing out NJ to size-up to my nail. Then, I placed the NJ paper on top of scotch tape. Then, I taped the side of the paper onto the actual piece of tape itself (weird, right?). Then, I cut out the shape of the NJ with a scissor. I removed all the excess tape and paper from the original piece of tape and then placed the tape onto my finger to paint over. What do you think of my RHONJ nails? I am SHOCKED that you don't have Tre's face on a nail. SHOCKED. Nailed! I love what you did here. Who is your favorite? Maybe I need to start watching this again. I liked the original OC show. I was a Really REAL OC housewife for a while. No cameras. I can't watch the OC show anymore because these bishes are hardly real and half aren't housewives. I got rid of my tv, so I don't watch very much of anything anymore. Goodbye $150 month cable bill, hello internet! It is all online now. haha. my fave is Teresa! !